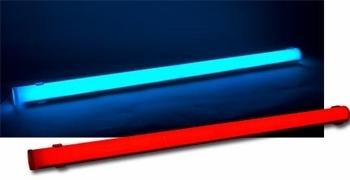 American DJ LED Color Tube II DJParts - All Variety of Parts that DJ Needs. Go Beyond Decorations...Make Your Parties More Memorable This Year! The LED Color Tube is an exciting, bright LED color changing tube that consumes very little power, generates no heat, and has an LED lifespan of 30,000 hours. The LED Color Tube includes an inferred wireless remote to change colors, a wall mounting brackets, and a base to mount the tube vertically. This lighting effect is best when used in multiples for home parties, holiday lighting, architectural lighting, retail stores, bands, night clubs, and mobile entertainers. Specifications: • 40-inch/ 1000mm LED Color Tube with UV-resistant polycarbonate tubing • 96 Bright LEDs (32 Red, 32 Green, 32 Blue) • 30,000 Long Life LED Technology • 15 Exciting LED Colors plus White • Rainbow color effect • Each unit includes one easy-to-use wireless remote to control: Manual Color Change; Auto Color Change; Flash; Rainbow Effect; Slow to Fast Color Strobing; On/Off • Includes AC power supply, two wall mounting brackets and base to stand LED Color Tube up vertically • Power Consumption: 6W • Dimensions (LxWxH): 40”x2”x2” / 1016x50x50mm • Weight: 2 lbs. / 1 kgs.